In principle, empirical models in ecology like theoretical models can be oral, physical, graphical, or mathematical, but since they represent data, the model format most often is graphs or mathematical expressions representing relations between two or more variables. These can be quantities, for example, numbers, weights, sizes, physical and chemical properties, or rates, for example, speed and metabolic rates, growth, birth, and death rates, and concentration changes. 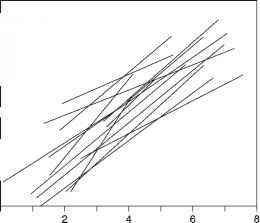 The relations between two or more parameters most often are represented as tables and graphs, and linear or nonlinear relations between parameters can be statistically treated. Supplied with appropriate uncertainty measures, such models can be named statistical models (see Statistical Prediction). In general, empirical models do not postulate process-based explanations whereas statistical models are more applied on data with more realistic process-based relations. The metabolism of the various organisms in ecosystems can be predicted from their type and sizes. Figure 2 The relation between predator and prey biomass. From Peters RH (1991) A Critique for Ecology. Cambridge: Cambridge University Press. found for food uptake and body mass of herbivorous and carnivorous warmblooded animals without differences between the two types. One model was I = 10.7M0'70, where I is the ingestion in joules per second and M is the mass in kilograms. For coldblooded animals, the equation was I = 0.78M0' 2 Combinations of allometric relations have been used to calculate new allometric relations, and other relations (Figure 2) are allowed to predict relations between predatory invertebrates and their prey on different climate regions, thereby increasing our understanding of functioning of ecosystems. However, one should always be aware of self-correlations leading us to trivial models, although tautologies, of course, can lead to improved understanding and inspire to new concepts. The overall quantity of organic matter in closed ecosystems is controlled by production and degradation. For the production of organic matter, we need energy, water, carbon, and other elements. In aquatic ecosystems, the relations between demands for phosphorus, nitrogen, and carbon compared to the availability of these elements are by far the highest compared to other elements. In terrestrial ecosystems water also is a major factor, and in all ecosystems temperature also is a regulator. Many empirical models for relations between these elements and the abundance and productivity of organisms have been made within or across ecosystems. Relations between net primary production in terrestrial ecosystems on a global scale and temperature show a sig-moid pattern with an increase between 0 and 20 °C, but the relation is questionable since it spans over different day lengths and temperature influences many processes other than photosynthesis. Relations between primary production and annual production show more a saturation-like pattern with a saturation value of about 2500 gCm~ yr~ occurring at about 2000mmyr~ . However, if only restricted climatic regions and specific vegetation types are considered, empirical models with much lower uncertainty can certainly be developed. And across biomes and ecosystems, similar simple relations can be expressed between biomass of herbivores and vegetation, and between carnivores and preys. But in terrestrial ecosystems, empirical models of resource response are indeed probabilistic and the ignorance of causal steps and many supplementary factors often increases their uncertainty and limits their application. In aquatic ecosystems, we can exclude water as a resource factor when we develop models across ecosystems which will simplify the relations. Compared to lakes, marine systems are much more open systems, which makes it difficult to establish relations between loading and concentrations of nutrients. In marine ecosystems, most often nitrogen is the limiting nutrient and our missing knowledge on regulation of denitrification in marine systems is one explanation for the scarcity of empirical models. One example is the relation between loading of total nitrogen and the annual phytoplankton production (Figure 3). Figure 3 Annual phytoplankton production as a function of nitrogen load in temperate coastal ecosystems (o), in nutrient-enriched mesocosms (*), and in Baltie, Dutch, and North American ecosystems (•). From Borum J and Sand-Jensen K (1996) Is total primary production in shallow coastal marine waters stimulated by nitrogen loading? Oikos 76: 406-411. Figure 4 Flow diagram indicating steps for empirical modeling of lake eutrophication. From Ahlgren I, Frisk T, Kamp-Nielsen L (1989) Empirical and theoretical models of phosphorus loading, retention and concentration vs. lake trophic state. Hydrobiologia 170: 285-303.
to a lake. From geological mapping and agricultural statistics, the contribution from cultivated and noncultivated areas can be registered; from meteorological observations the contribution from the atmosphere can be calculated and from the human population density the anthropogenic input can be calculated. 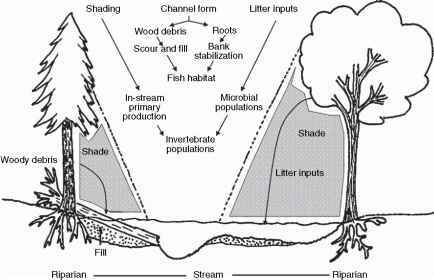 Depending on the type of watershed, more elaborate submodels can be adopted including other phosphorus point sources like industry, fish ponds, and livestock or by separating the watershed in other types or mixtures of point and diffuse sources summing up the total load phosphorus and or other elements like nitrogen. Together with a hydrological budget and the morphometry ofthe lake, we can calculate the total load as amount, average inlet concentration, lake area load, or lake volumetric load. where s is a sedimentation coefficient (yr_1). The exponent was significantly lower than the 0.82 found in the OECD study and the 0.83 which was found when the P = ^(Pi)p equation was applied on the OECD data. This shows the danger of applying empirical models developed on large data sets on the behavior of single lakes. The explanation of the weaker response in the average behavior of single lakes lies presumably in assumption of true steady state after load reduction is not fulfilled - the lakes are still influenced by internal load and are only in quasi-steady state. Figure 5 Regressions performed for in-lake vs. inlet concentrations of phosphorus during pre- and postrestoration steady state. From Sas H, (1989) Lake Restoration by Reduction of Nutrient Loading. Sankt Augustin: Academia-Verlag Richarz. From Ahlgren I, Frisk T, and Kamp-Nielsen L (1989) Empirical and theoretical models of phosphorus loading, retention and concentration vs. lake trophic state. Hydrobiologia 170: 285-303.
controlling the algal biomass. 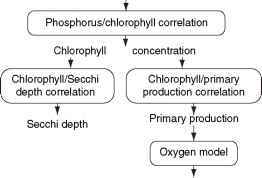 Many empirical models for the relation between phosphorus and algal biomass expressed as chlorophyll have been published. They are not all comparable because different time periods have been used. In the OECD study, annual averages were used, but most studies compare annual averages of phosphorus with summer (May-September, Northern Hemisphere) values of chlorophyll. In the majority of studies, linear models are generated with slopes from 0.4 to 1 in the range up to 100mgPl-1; other models are logarithmic and models with defined maximum levels or dependence of both phosphorus and nitrogen have been published (Table 1). As for the phosphorus loading models, the uncertainty can be reduced by grouping the lakes by depth and geographical position. Also, screening for nitrogen limitation may reduce uncertainty. Figure 6 Regressions performed for summer average of chlorophyll a vs. annual average concentrations of phosphorus. From Sas H (1989) Lake Restoration by Reduction of Nutrient Loading. Sankt Augustin: Academia-Verlag Richarz. empirical models and the danger of applying models developed across lakes on single cases. 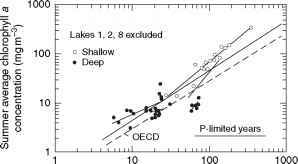 By grouping in shallow and deep lakes, an exponent for shallow lakes of 1.4 ± 0.3 was found and one of 0.6 ± 0.5 was found for deep lakes. Although the number of data was critically low, the data allowed an error analysis and maintained at least a qualitative difference in response between deep and shallow lakes. A similar study of the relations between transparency and phosphorus levels came up with an exponent of —0.34 compared to the OECD value of—0.28 ± 0.11. Since phosphorus is the main controlling factor in lakes, many other parameters have been found to relate to mean annual phosphorus concentrations (Table 2). In ecotoxicology, empirical models are widely used both to model the fate and to model the effects of toxic substances in ecosystems. The fate and transport of inorganic substances like heavy metals can be modeled as the nutrient models above using empirically derived retention coefficients. In addition, the well-described chemistry of inorganic substances allows inclusion of theoretically based elements of chemical reactions and influence of, for example, pH and temperature. From Peters RH (1991) A Critique for Ecology. Cambridge: Cambridge University Press. 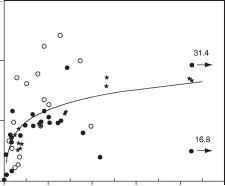 Figure 7 The effect of the octanol-water partition coefficient (Pow) on the bioconcentration factor of organic compounds by aquatic organisms. From Peters RH (1991) A Critique for Ecology. Cambridge: Cambridge University Press. study brought relationships between area and number of individuals, number of habitats and number of species, and habitats and diversity. The strong interrelations between area and number of individuals and habitats were reflected in the lack of relation between the area and the residuals from the regressions. It was concluded that it was not possible to separate the individual importance of abundance, area size, and number of habitats for the diversity of birds. A more successful study was carried out on plants on the Shetland Islands. In the study, it was shown that the direct effect of area and number of individuals had the same positive effect on the diversity of plants, but since the area created a linear increase in number of habitats and also an increase in number of plants per area, the area had an influence twice as great as the effect of habitat variation.